Leverage the most effective teaching practices at the most effective time to meet the surface, deep, and transfer learning needs of every middle school and high school mathematics student. Preview High School edition: PAR, Peer-Assisted-Review. Discover the right mathematics strategy to use at each learning phase so all students demonstrate more than a year’s worth of learning per school year. 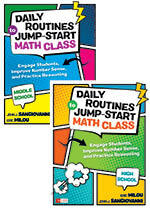 Kickstart your class with 20 different routines that promote student reasoning and number sense, all of which include content examples, extensions, and variations for grades 6 - 8 and 9-12. The same five practices teachers know and love for planning and managing powerful conversations in mathematics classrooms, updated with current research and new insights on anticipating, lesson planning, and lessons learned from teachers, coaches, and school leaders. ALL students should have the opportunity to be successful in math! With experts such as Linda Gojak, Ruth Harbin Miles, John SanGiovanni, Skip Fennell, Gary Martin, and many more, you have a clear path to help students move from surface-to-deep mathematical understanding, from procedural-to-conceptual learning, and from rote memorization to true comprehension. Through books, videos, consulting, and online tools, we offer a truly blended learning experience that helps you demystify math for students. Our forward-thinking and practical offerings help you enable all students to realize the power and beauty of math and its connection to everything they do. Meet Erin Null, Acquisitions Editor, Corwin Mathematics, and learn more about opportunities to Publish with Corwin.